Image Size: 74"w x 42"h.
Abstract yet representational, graphic though fully rendered, a traditional but thoroughly modern painting only begins to describe "Eternal Triangle." The kaleidoscope of color that illuminates the skyline behind the triad of tipis is yet another distinctive characteristic of this powerful landscape from Tom Gilleon. Our giant MuseumEdition™ Canvas at 74"w x 42"h is a Western tour de force for large spaces that demand a signature work. “Looking back, I was probably most influenced by the old era art directors and illustrators who had the amazing ability to quickly and simply tell a story or convey a feeling with their artwork. I believe that this simplicity and strength is the key to fine art. Light, color, value, composition and line are paramount in importance.” – R. Tom Gilleon R. Tom Gilleon’s art is hard to pigeonhole. His interpretations of the American West are genuine and unique. 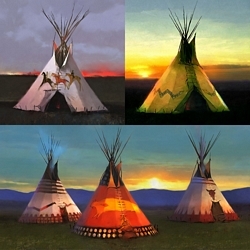 His representations of native teepees are archetypal and primitive in their basic forms yet they are remarkably contemporary in composition with a sprinkling of personal symbols and humor. Gilleon’s work is coveted by collectors, increasingly finding homes in prominent museums and auctions such as the Coeur d’Alene. Gilleon was born in 1942 and raised in Florida by his grandparents in the tiny outpost of Starke, near Jacksonville and the storied banks of the Suwannee River. His grandfather had immigrated to the United States from Scotland and became a renowned cabinetmaker. His grandmother was a full-blooded Cherokee. Gilleon earned a scholarship to play baseball at the University of Florida where he took courses in architecture. He served in the Navy in the early 1960s and then worked as an illustrator for NASA’s Apollo space program. Eventually, he went solo as a freelance illustrator based in Orlando and was hired by The Walt Disney Corporation to deliver conceptual sketches and designs for its Disney World theme park. Later, he moved to California to work at Disney’s Imagineering studio which designed Epcot Center and then Gilleon assisted in the planning of Disneyland Tokyo, Disneyland Hong Kong and Disneyland Paris. The American West left a mesmerizing impact on him as an artist. Gilleon and his wife first built a home along the Dearborn River in Montana, and later purchased a ranch near Great Falls not far from the legendary Old North Trail where native peoples traveled millennia ago from the Arctic to the desert Southwest. Here Gilleon found clusters of teepee rings from encampments which inspire him to contemplate how the camps might have looked centuries ago.